Electronics 7 are industrial clocks with luminescent indicators where each figure was formed by four or eleven 7-segment lamps. For each indicator there was a board decoding the binary code sent by the main board. There were also models based on light-emitting diodes . 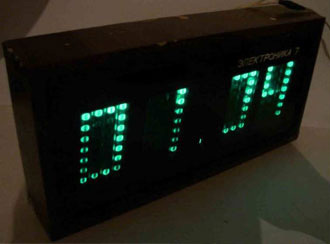 The basic shortcoming of the clocks was that the segments of the display were gradually burnt out, and there was a significant difference in a luminescence between more often and less often displayed segments. It usually happened after ten or more years of continuous work. All the street and wall clocks were based on the kit by Saratov factory "Reflector" and even now are used in many administrative and industrial premises in Russia. The clocks were made on the basis of vacuum-fluorescent indicators manufactured in Russia.